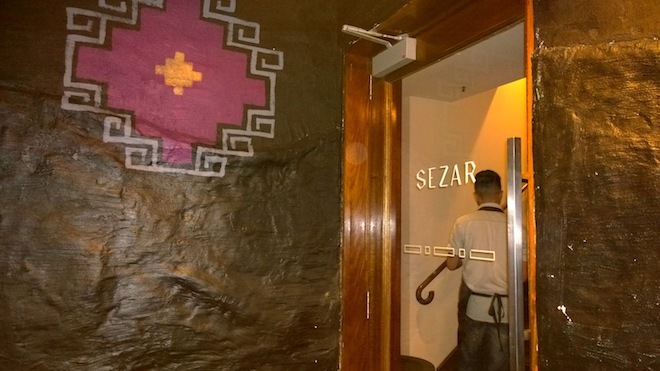 I first dined at Sezar on my birthday last December. I had heard of this new Armenian restaurant which had taken over the location of the Canary Club on Melbourne Place. 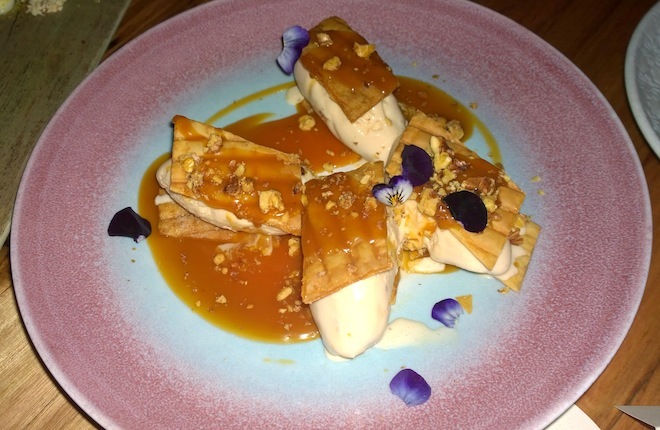 It ticked all my boxes – hidden down a Melbourne laneway, tapas style allowing me to try multiple dishes and a cuisine I hadn’t tried before, nor knew much about. I loved everything about it back then and promptly recommended that all my friends and family try it immediately. 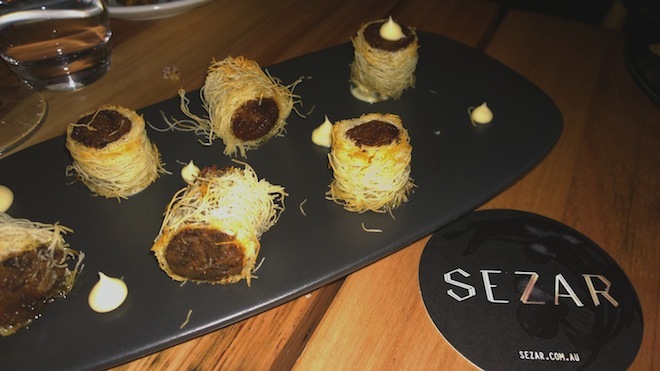 You won’t be surprised, therefore, that I almost squealed out loud with delight when the invitation came to attend Sezar’s new Autumn Menu launch. 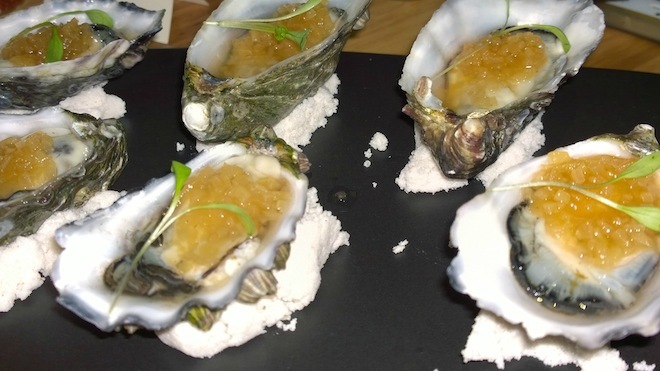 Oysters –served with compressed apple and anise. The tartness of the apple paired so well with the creaminess of the oyster, leaving a fresh sensation in your mouth ($9, 2 pieces). 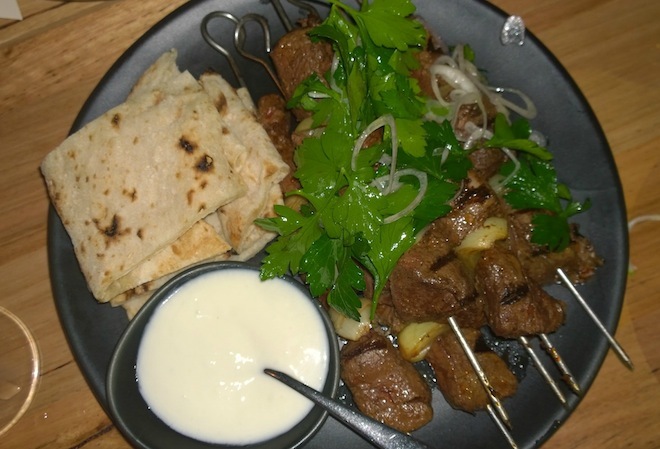 Bastourma & egg – the Armenian version of bacon and eggs in a way. Undoubtedly one of the standout dishes of the evening. 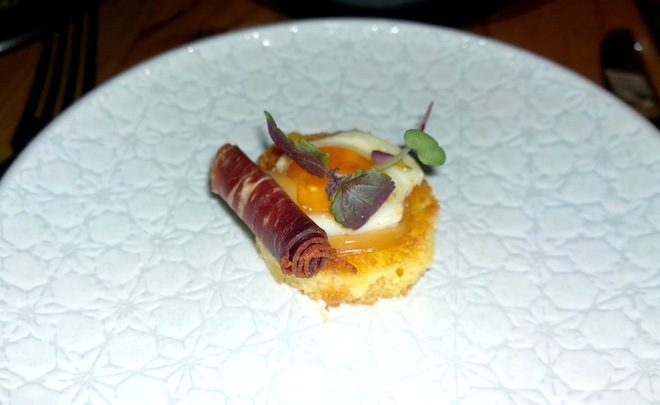 This dish had the right amount of saltiness (bastourma), velvetiness (quail egg) and sweetness (brioche) finished with the boost of flavour from the garlic jam ($10, 2 pieces). 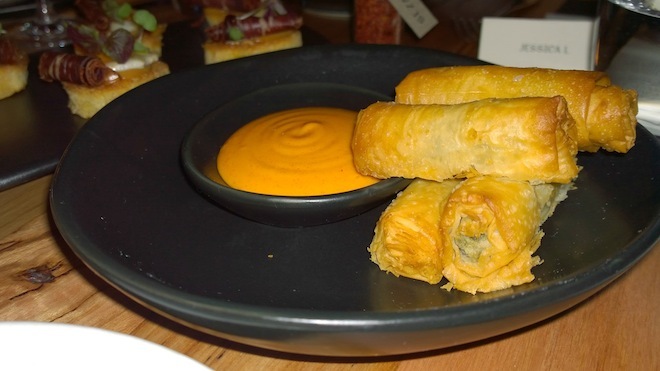 Spinach & feta boreg – a Middle Eastern favourite, these boregs made use of the abundance of spinach in season at the moment, encased in the lightest and crispiest filo pastry ($12, 3 pieces). 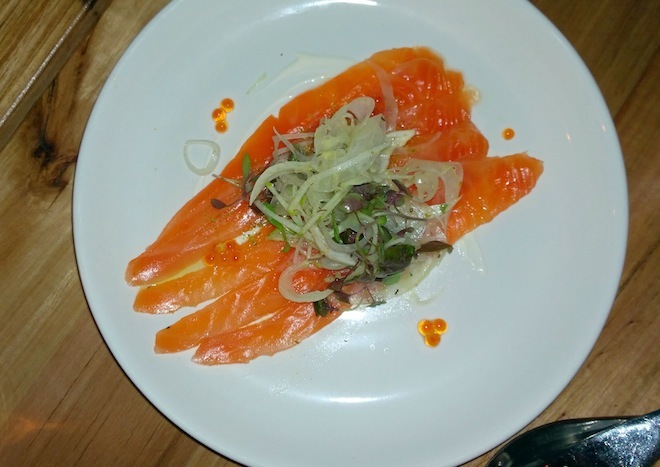 Cured ocean trout – I’m sensing a theme of tarty fruit and aniseed with seafood here. As with the oysters, the trout was served with an apple and fennel salad, finished with salty capers, crème fraiche and roe that were like juicy, popping jewels ($16). 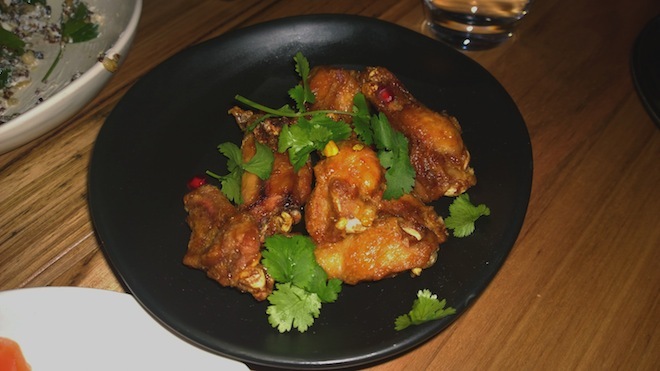 Twice cooked chicken wings – basically the Armenian version of fried chicken. These weren’t on the printed menu we received but a most welcome bonus. I don’t know what the wings were marinated in but they were so flavoursome I could have eaten the whole plate. The addition of pomegranate seeds and pistachio nuts took them to a new level and gave what might otherwise be a relatively heavy dish, a freshness ($17). 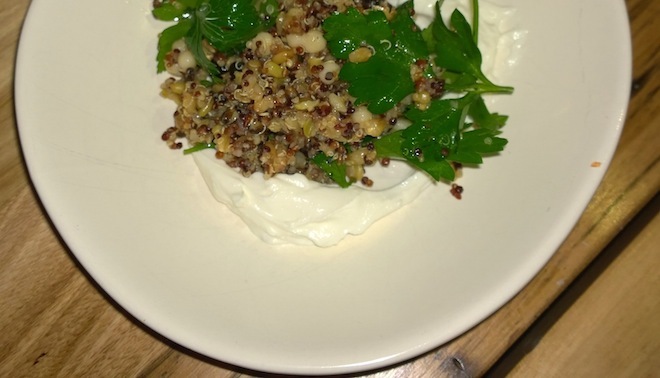 Grain salad – a great accompaniment to the other dishes or, if you prefer, could easily be a dish in its own right ($15). BBQ King Brown mushrooms – this dish was almost too pretty to ruin. 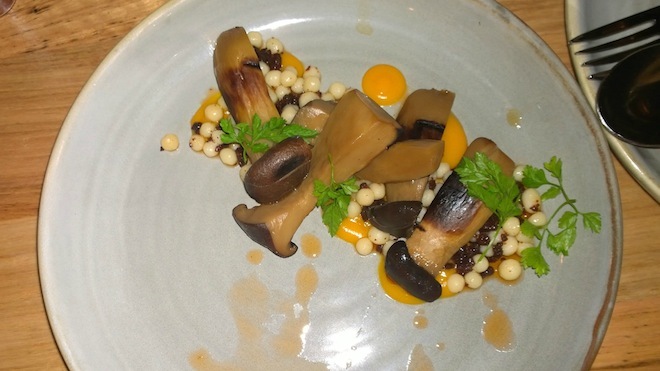 The earthiness and softness of the mushrooms was perfectly set against the toasted Israeli cous cous, which was unusually crunchy. The sweet potato and sujuk sausage again elevated the dish to a new level and added bursts of interesting Armenian flavour and texture ($17). 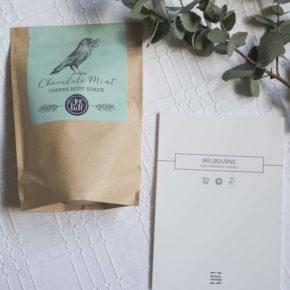 Braised lamb – I instagrammed on the night that these were parcels of pure joy and I stand by that entirely. Slow cooked, succulent lamb neck compressed into small bite-size parcels and wrapped in light and crunchy kaitaifi pastry. Need I say more? They were positively the most scrumptious dish of the night and hands down my favourite ($16). 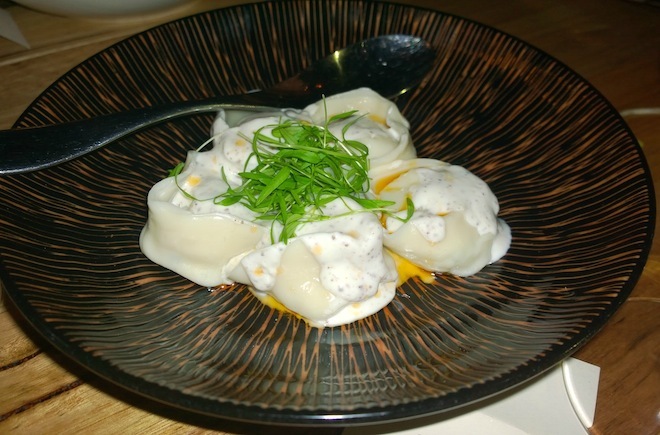 Spanner crab manti – these were a beautiful ode to the old country and the new. Traditionally filled with mince, steamed and served with sumac yoghurt, these manti take advantage of mouthwatering Australian spanner crab and were served the same way ($16, 4 pieces). BBQ Wagyu tenderloin – by this stage, extremely full, but determined to try this dish and I’m glad I did. Cooked to rare perfection and so tender all it required was a butter knife, this Wagyu was second to none ($22). 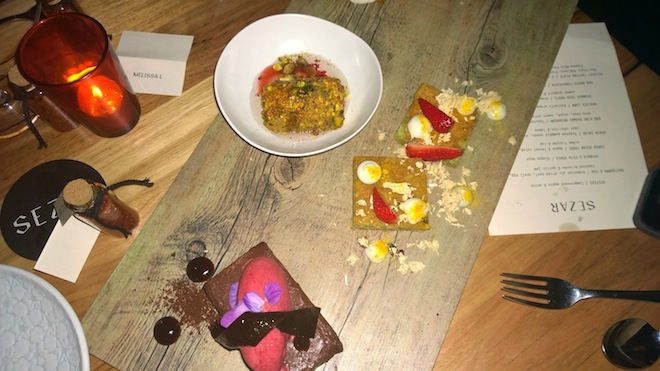 Thank goodness a short break followed before the presentation of the pièce de résistance – the dessert tasting plate ($40). What an amazing way to end a meal – fluffy pistachio sponge cake with glazed strawberries, cardamom and orange blossom; the richest chocolate marquis with sour cherry sorbet; almond milk panna cotta with slow cooked pear and cloud-like honeycomb; pistachio crusted vanilla parfait with berries and rosewater syrup; and last but not least, the incredible new style baklava with walnut toffee and salted caramel. I could go on describing how mind blowing this all was but let’s leave it at this: I ate it all and in this instance, pictures say a thousand words. While I feel like we were served everything on the menu, there are many dishes still to try. I have already booked in my next Armenian feast. But don’t take my word for it, get there and try it yourself. You won’t be disappointed.